© 2013 R.L. 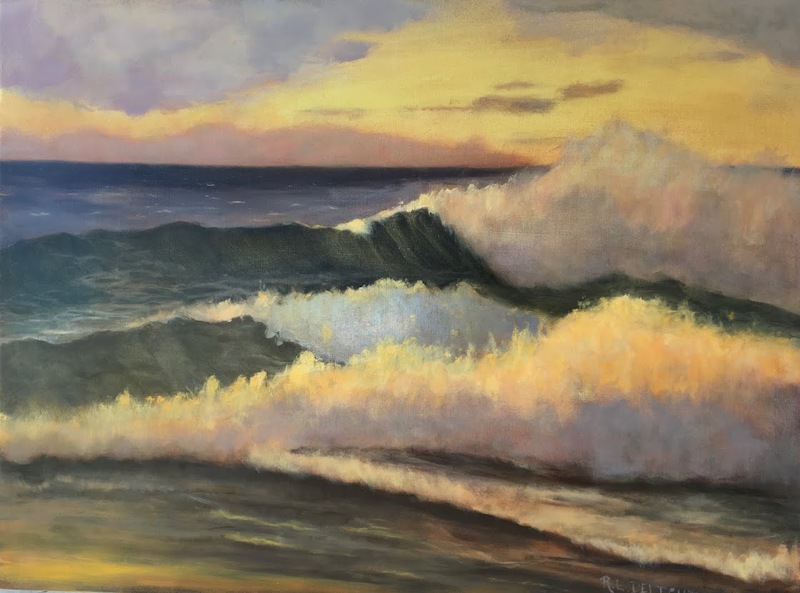 Delight, Wave Study #62, 6"x8", oil on canvas. When I go to my usual spot at the foot of Neahkahnie Mountain to paint wave studies, I like to go a little before the high tide. The waves are usually at their largest and I can get closer to the action, depending on conditions. If high tide is before noon, I head out in the morning to paint. If it is in the afternoon I head out after lunch. Lately the high tide has been hitting in the afternoon. It is about to hit evening which means I will have to wait until it cycles back around to a reasonable hour in the morning. When that happens, my ideal plan is to head up the coast a few miles to paint in places like Hug Point and Short Sands Beach which are best accessed when the tides are lower. One of the joys, and sometimes pains, of painting plein air seascapes is that conditions are always different from day to day, and even minute to minute. No squalls yesterday but sunshine and a small insistent breeze. I brought all my rain gear anyway. I learned my lesson! I was able to remove the rain gear but admit I should have put my outer layer back on toward the end of the day as the breeze was making me cold. I didn't want to stop and do that so I shivered the last half and hour of painting. It is hard to stop when you are racing against sun and tides. I am studying books and reading blogs to help me improve. Sometimes trying new approaches and making new observations means a step back and some, and sometime most, of the elements slip. Not only am I out of practice but I am trying new things. In spite of the many things I can see that need to be tweaked or fixed on this 2 hour study, I am fairly pleased with the results. 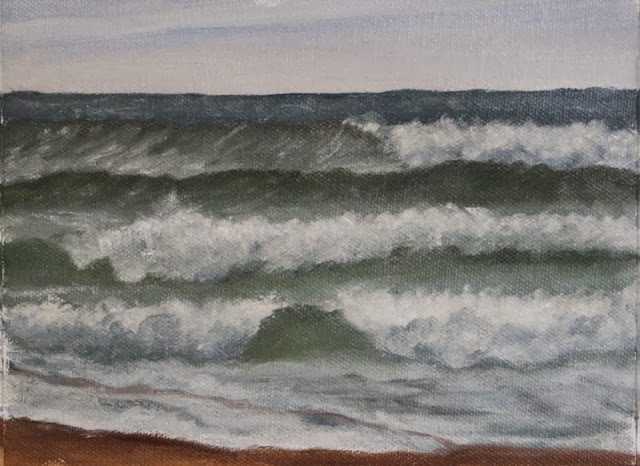 I was trying hard to capture the afternoon autumn light on the waves and I feel I did manage to get a tiny bit of it. It wasn't a perfectly clear day and the sunlight was diffused as is often the case here on the coast. After painting yesterday afternoon and hauling gear for a band rehearsal in the evening, I am a bit sore in my middle today. I am feeling quite well but my body does let me know when I need to back off a little. So today, I am going to go out and sketch a bit and then work on another project that is due this weekend. We shall see if I am fit to go out to paint tomorrow. Oh, it feels so good to be back!